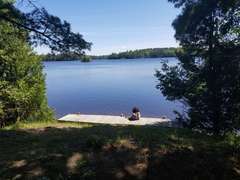 This is cozy cottage located right on Torch River. This home is unique because from the front door you will see the popular all-sports Torch Lake and out the backdoor you gaze upon Torch River. The public beach access is directly across the street from the property, which has an enormous sand bar. In addition, with a private dock, this home allows you to use bring your own water vessel or you are free to use the kayak & paddle boat which are included in your stay. Having a main floor and an upper level, there is enough space to separate yourselves for some peace and quiet! Upstairs plays host to the 2 bedrooms and only bathroom in the home, while the main floor is occupied by the kitchen and living room. An attached-garage is also where you will find water goodies and extra supplies. With patio furniture, hammock, and fire-pit, you will thoroughly enjoy your time on Torch River. 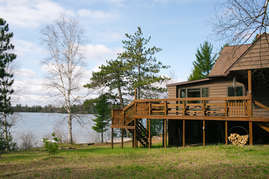 TORCH RIVER RETREAT - directly ON Torch River SLEEPS: 4 MAX BEDROOMS: 2 BATHROOMS: 1 *RIVERFRONT (Torch River backdoor, Torch Lake front door) *SWIMMING ON PROPERTY *KAYAK, PADDLE BOAT Included *PRIVATE DOCK FREQUENTLY ASKED QUESTIONS ATV's: Not allowed on property Bathroom: 1 full bathroom on upper level Beach/Swimming: The public access beach is right across the street from the home. Swimming can also be done on the property. On the property, there is a break-wall, and then the water. It is shallow and gradually increases in depth. Bedroom Configuration: Master Bedroom-upper floor: 1 Queen bed Bedroom #2-upper floor: 1 Full bed Boats: Kayak & Paddle Boat is included in you stay Cell phone service: Sprint seems to work well Distances: * Traverse City: 35 minutes (24 miles) * Grand Rapids: 2 Â½ hours (147 miles) * Mackinac Bridge: 2 hours (108 miles) Dock: 30 foot private dock for your use Fishing License: You can purchase your fishing license online. Grill: Propane Grill is on property with an extra tank in the garage. Propane provided Grocery Store: There is a convenient store about a mile up the road Internet: Wi-Fi Linens: Yes, we provide your sheets and linens. Just like a hotel, the beds will be made for you upon arrival. If you are fussy about the thread count of your sheets, just let me know, and I'll make sure we leave a bed open for your sheets. We have just the basic sheets, pillows, pillow cases and bath towels. Pets: Dogs 15lbs or less will be considered. Please contact us. Freshwater Vacation Rentals currently charges $50/per pet for your entire stay. We do ask that you please clean up after them both inside and outside the cabin. Plus, if you allow them on the furniture, we do ask that you please bring your own linens/blankets for them to sleep on. Just let us know which bed you will be using with them, and we'll make sure it is ready for your sheets when you arrive. Plus, if the pet hair starts to build, we do ask that you please run the vacuum. Generally, dogs love the water and places to explore. Pet food does tend to attract mice, so vigilance is needed. Towels: Yes, we provide towels. It's always good to bring extra though. Washer and dryer: The home does not have a washer/dryer. Wood: Guests can find fire wood for sale about a mile from the home. 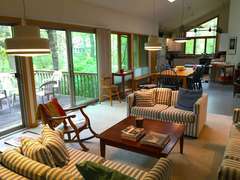 Beautiful, waterfront Torch Lake property!-eciateWe were very pleased with our decision to stay at the Torch River Retreat!! For starters, the home was very crisp and clean, and was adorably decorated with all the “beachy” accessories! We also really loved being within walking distance to the public access point of Torch Lake which was immediately across the street, and enjoyed the beautiful view of Torch River in the backyard. During the day we utilized the paddle boat and kayak provided with the property, and we spent our nights curled up with a bonfire under the stars. While at the lake a neighbor even introduced herself to give us tips of where to eat and explore! It was truly a perfect little getaway and we would definitely recommend to anyone looking to visit Torch Lake!! !